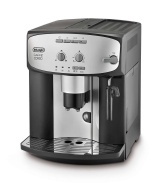 alaTest has collected and analyzed 88 reviews of Delonghi ESAM 5400 Perfecta. The average rating for this product is 4.4/5, compared to an average rating of 4.4/5 for other products in the same category for all reviews. People really like the reliability and performance. The maintenance and price also get good feedback, but comments are divided on the design. Many are negative about the capacity and noise. We analyzed user and expert ratings, product age and more factors. Compared to other products in the same category the Delonghi ESAM 5400 Perfecta is awarded an overall alaScore™ of 84/100 = Very good quality. Easy to use, bought it for work and our people love it. Ease with which you can make a single cup with choice of strength and then immediately chose to make another cup (or more) of different strength. Ease with which to initially adjust the quantity for the cup. Although cost might seem expensive it truly is worth every penny. Lots of features etc and makes brilliant coffee using beans or ready ground. Can't fault it. Brilliant. it really is good for the money as had one to do the same but not very good.